1.Start by placing both hands, one hand over the other, in the heart healing position – across the middle of the chest. Take three breaths in. 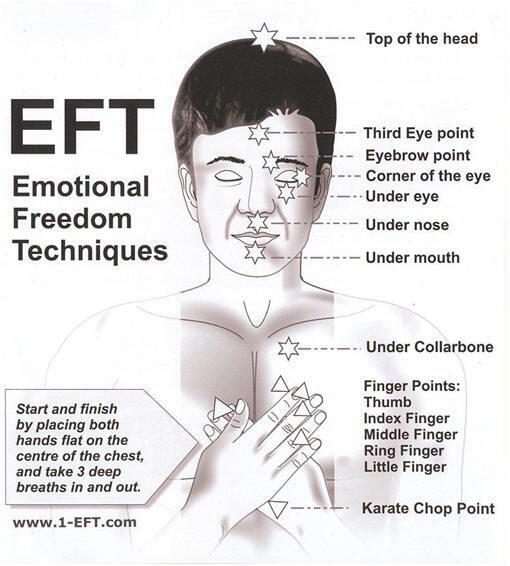 2.Tap lightly on each point (see diagram) from the Top of the head point to the Karate chop point. 3.Finish the round by assuming the heart healing position once more and take in three deep breaths. The SUE Scale is used to measure the amount of distress you feel when you think about the issue - minus 1being a little stress, minus 10, a great deal of stress. You can keep tuning in to the scale to see how your stress levels are as the energy begins to reduce or shift in your body. As you talk about it what emotion do you feel? Where do you feel that emotion in your body? Can you give that emotion a colour, a shape, a texture (is it hard, soft, etc)? 1.Take three in breaths and when you breath out say (or think) ‘this stress’. Where are you on The SUE Scale? 2.Begin to gently ‘tap’ on the points from the top of the head point to the karate chop point (see diagram below) with the fingertips of one hand. You can use either hand. Repeat ‘this stress’ as you tap. 3.Take three in breaths and when you breath out say (or think) ‘this stress’. 4.Ask yourself where you are on The SUE Scale and if you have noticed any changes. 5.Take three in breaths and when you breath out say (or think) ‘this knee pain, I’m fine’ Tap again around the tapping points head point to the karate chop point (remember to say or think ‘this knee pain, I’m fine’). You may feel the energy move when you tap. In the example of knee pain above, the pain may go to the thigh (tap for ‘this pain in my thigh, I’m fine’), continue chasing the pain like this until it has left the body. You may have hundreds of painful memories surrounding an issue. It’s important to remember that you don’t need to work on every single memory. Working on 3 or 4 will affect the whole issue and release the negative emotions regarding that issue from your energy system - the issue will simply collapse.